HMS Natal was a ‘Warrior Class’ cruiser, launched at Barrow in Furness on 30th September 1905. 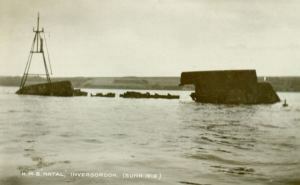 In 1914 she joined the Second Cruiser Squadron, which by 1915 was based in the Cromarty Firth, in the north of Scotland. The Natal had arrived in the Cromarty Firth the week before Christmas under the command of Captain Eric Back and was enjoying some respite from duty in the North Sea, anchored between Cromarty and Invergordon. As a treat for some locals a film show was organised for the afternoon of 30th December and earlier that day a party of guests including QARNNS nurses, and some civilians including children had also arrived on board. At twenty past three in the afternoon there was a huge explosion on board followed by several lesser internal explosions and a fire began to rage below. 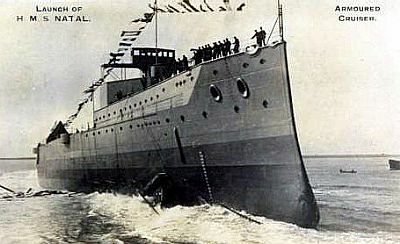 The Natal slowly keeled over to port while some members of her company escaped into the water but within five minutes the Natal had completely capsized. There was a terrific loss of life with many killed in the explosion and many more were drowned as the ship sunk, or died of exposure in the freezing winter waters of the Cromarty Firth. 421 lives were lost. The site has since been recognised as an official war grave and a buoy still marks the spot where she sank. A few of those who died on the Natal are buried in cemeteries at Rosskeen and Cromarty.